My sports ineptitude is legend. The phrase “can’t hit the broad side of a barn” was coined to describe my throwing prowess. So when my dad brought home a couple bows and set up a hay bale-backed target in the backyard, we all expected that I would wipe out half the squirrel population by accident. All of us were surprised (stunned, shocked, amazed) to discover that archery was something I could actually do. No neighborhood pets or small children were harmed as I practiced. It appeared that all I had needed for my latent athleticism to emerge was a sport that involved weapons. I had almost forgotten archery, however, when I went to Japan. 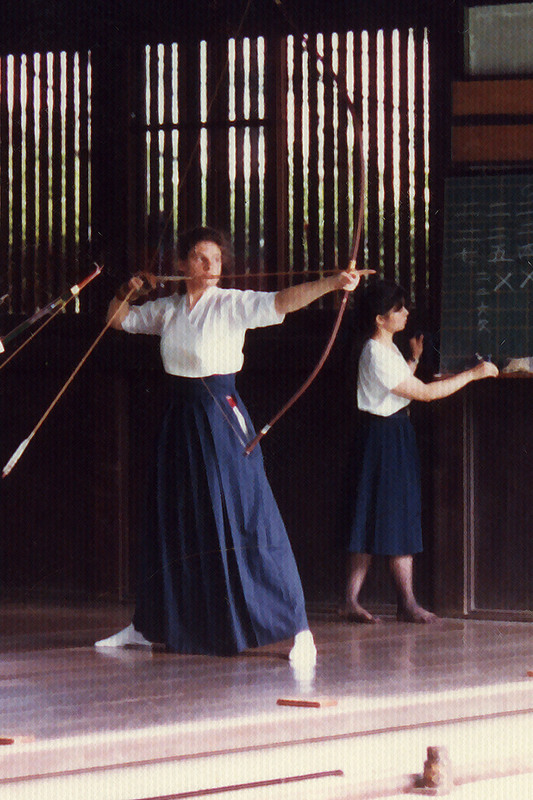 Then I saw a photo of a young woman practicing kyudo, Japanese archery, and I had to try it. 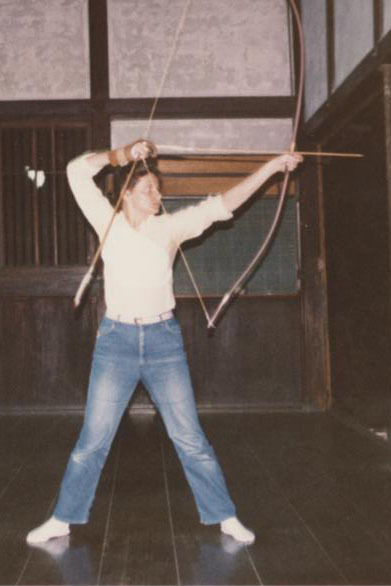 To be honest, my infatuation with kyudo at the beginning had a great deal to do with the sheer beauty of the Japanese long bow: no pulleys and gizmos that make a compound bow so ugly. But I have to say it was also the clothes: a long, graceful pleated skirt—the hakama; the pristine white wrap shirt—the dogi; and the way-cool leather glove. A friend helped me find a practice hall and a teacher willing to take me on and I was ready to go. Once a week I took the bus to the far side of town to a temple precinct near the Kyoto Craft Center. It was the high point of my week, a ritual that even now, more than 20 years later, brings me pleasure to remember. My first night, however, was almost my last. I’d received instructions on how to raise the bow, sight the target, concentrate, lean a bit, and draw. All this was done in pantomime. My instructor, Oda-sensei, did not speak English and my Japanese had not even reached rudimentary stage. He finally indicated that I was to release the bow string—less the arrow. I let go. My eyes snapped wide open and my mouth dropped. I only just stopped myself from screeching. Amazon archers were said to amputate their left breasts before learning to use the bow. Now I knew why. It was that or have the bowstring amputate it for them. Now not only was I in pain in an embarrassing location, I was going to have to explain the situation in my almost non-existent Japanese to a virtual, and male, stranger. “Doko?” (Where?) he asked. I’d reached the end of my appropriate vocabulary. I pointed. “Ah!” he said with raised eyebrows. “Chotto mattei.” He ran off and came back with a muneate, a breast guard. Apparently I was not the only woman archer who had faced breast amputation. I was back in business. The muneate Oda-sensei supplied was not perfect. I am much taller, more broad-shouldered, and more generously built than many Japanese women. So though the vinyl muneate did the job, it was, so to speak, a bit of a stretch to arrange it to cover the ground. And being vinyl, on cold evenings (and winter evenings in an open-sided dojo in Kyoto are very cold), the muneate could be a bit resistant to wear until it warmed up. (I learned not to roll it up, or bend it in half when I stored it in the locker.) And so I coped. Until, that is, I came back to the US for Christmas to visit my family. Being a DIYer, I brought the muneate with me and enlisted the help of my parents. A visit to the leather supply store, a few experimental patterns, some carefully placed darts, and I soon had a custom-fitted, white leather muneate. Good old American ingenuity meets Japanese practicality. And it looked very classy to boot. 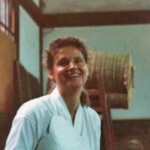 When I returned to the dojo (practice hall), no one noticed, at least overtly. I did catch a couple of sidelong glances cast at my new piece of equipment. I didn’t care. I had everything covered. Finally, after many months, one woman carefully asked where I got my muneate. When I told her I’d made it, she nodded, but the look she gave me said, I don’t believe it. 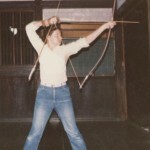 I practiced kyudo for more than a year, one of only four non-Japanese at the dojo to do so. The others were two Swiss men and a French woman. I only ran into the French woman once. Her English and my French were on a par so we talked in Japanese, our common language, to the amusement of the Japanese archers. I finally took the test for shodan, the first level in the kyudo ranking system, and passed—wearing my muneate. When I left Japan, I returned the borrowed bow, hakama and glove. I still have my dogi, my tabi, and my muneate, although I have no place to wear them. I was never able to find a kyudo dojo close to where I lived. For a long time, every Friday night, I was homesick for my bus ride across town. Now my kyudo equipment lives in a cedar chest with winter sweaters and old toys. Every time I open the chest, I take out the muneate, and I can’t help smiling at the memory of my evenings in the dojo and the only sport I ever practiced. 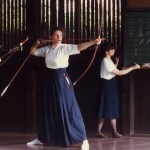 This entry was posted in Archery, Japan, Kyudo, Muneate, Sports by sharon. Bookmark the permalink. Maybe you live near one of the kyudo practice groups begun by Kanjuro Shibata Sensei. 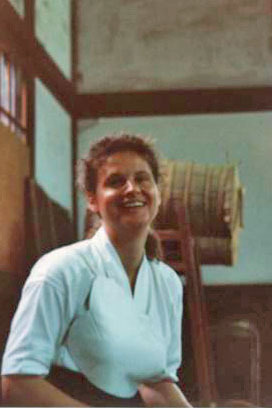 If you don’t, there are at least kyudo intensive of various lengths of time throughout the year at places like the Garrison Institute, Zen Mountain Monastery, and Karmê Chöling (where there is an azuchi). Susan, thank you so much! I will have to look into these.